Smooth, dapper, thin-mustached Kenneth MacDonald dates his acting career back to 1909 when he was a child actor at eight on the legitimate stage. Born Kenneth Royce Dollins September 8, 1901, in Portland, Indiana, where his father was an auctioneer and his mother was a teacher. He grew up in Richmond, Indiana, where he earned seven letters at Richmond High School as a member of its football, basketball and track squads. He was the first president of the Richmond Athletic Association. His last appearance in Richmond was in 1970 when he returned for the 50th anniversary of his high school graduating class. MacDonald went on the stage in the early ‘20s, appearing in some 3,000 performances before American and Canadian audiences. 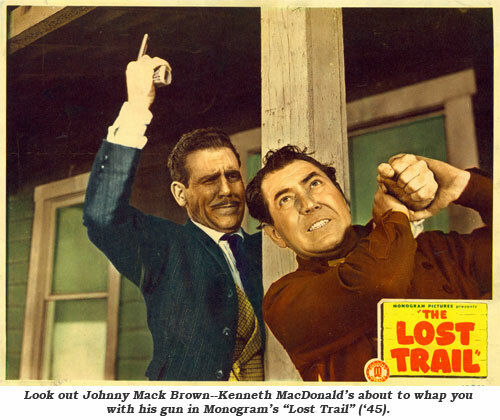 Finding entrance into films tough, he wrote and published a pamphlet “The Case for Kenneth MacDonald”. This self promoting booklet was distributed to all the studios and finally landed him a part in “Slow as Lightning” in ‘23 followed by “What Love Will Do”, “Dynamite Dan”, “Yankee Speed”, “After A Million” and others including a series of two reelers (co-starring Milburn Morante) under the “Fortune Hunter” designation. 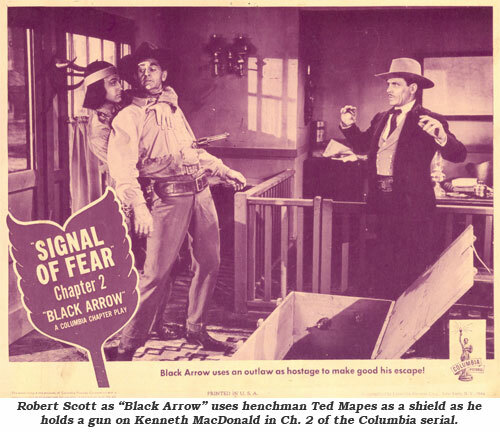 His last silent was “Little Buckaroo” with Buzz Barton. In 1931 Kenneth claimed a small role in Jack Holt’s “Dirigible”. 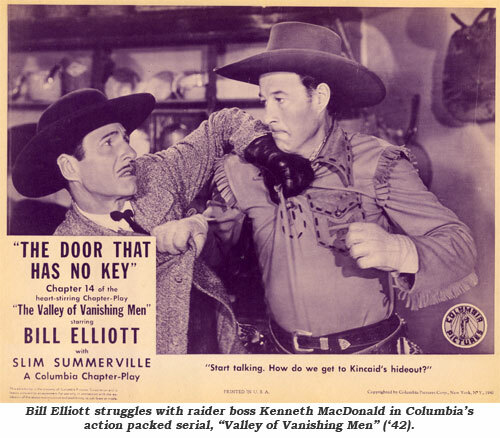 By the mid ‘30s on into the ‘40s, MacDonald was the suave crook with black manicured mustache menacing Western stars Charles Starrett and Bill Elliott at Columbia. 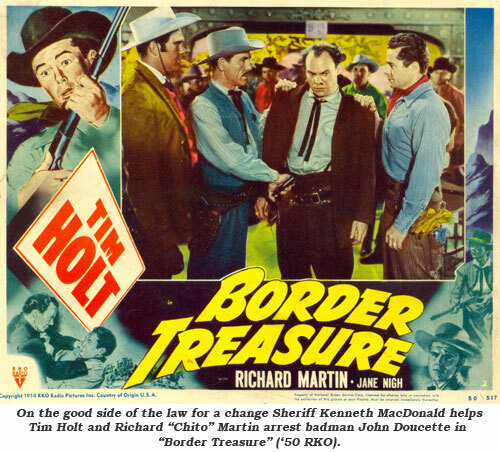 Maturing by the mid ‘40s on into the ‘50s, MacDonald became more of a character player, turning up as cops, doctors, military officers and as quite a few sheriffs in Westerns with Tim Holt, Allan “Rocky” Lane and on TVers like “The Lone Ranger”, “Cowboy G-Men”, “Annie Oakley”, “Stories of the Century”, “Cheyenne”, “Wanted Dead or Alive”. 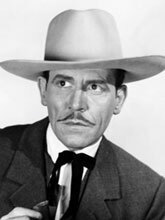 He had a recurring role for a while on Warner Bros.’ “Colt .45” as Colonel Parker. 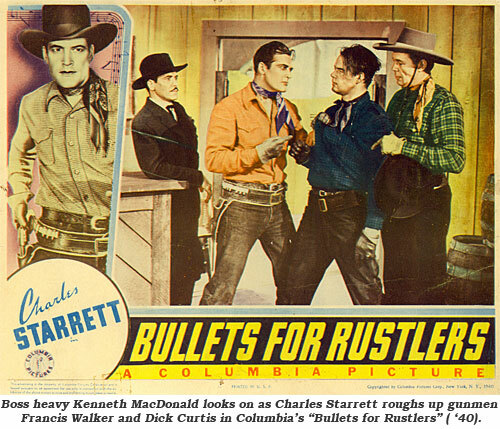 MacDonald gained great notoriety in the late ‘40s and early ‘50s as a comic foil in several Three Stooges Columbia shorts including Westerns like “Shot In the Frontier” (‘54) and “Punchy Cowpunchers” (‘50). It was his work with the Stooges that landed him the recurring role as a Superior Court judge for 32 appearances on TV’s popular “Perry Mason” (‘57-‘66). It seems Sam White, whose brother Jules was in charge of many of the Three Stooges comedies, was a member of the Mason Production team. Sam remembered MacDonald and suggested him for the role of the judge. He was married to La Mee Nave MacDonald. His parents were John Wesley Dollins of Kentucky and Mary Tate of Indiana. MacDonald died at 70 of a brain tumor and a tumor in his left lung at the Motion Picture Country Hospital in Woodland Hills, California, on May 5, 1972. At the time of his death the MacDonalds were living on North Griffith Park Drive in Burbank. The suave badman is buried at Forest Lawn Memorial Park, Hollywood Hills, California.